Joining fabric for curtains can be much more difficult than you might think. If the patterns don’t align, the results can vary from not-quite-right, to totally hideous. That said, joining curtain widths is something you can do yourself, and all you’ll need are a few common tools and a little bit of practice. 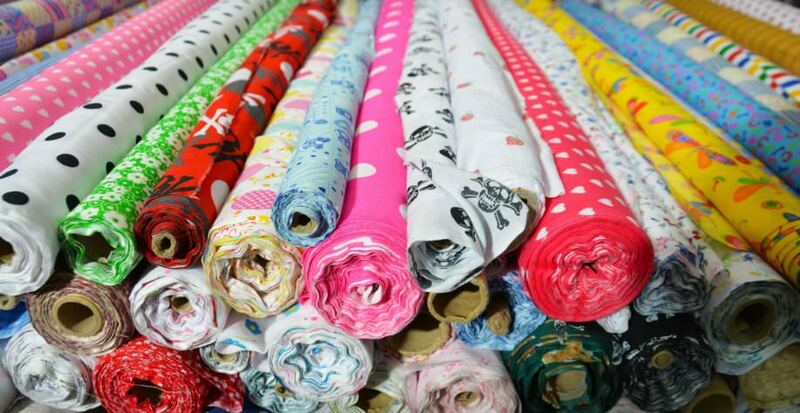 In this article, we’ll guide you through the process of matching fabric patterns while sewing. This is a job that takes time and patience, particularly if you’re not a seasoned tailor – so be prepared to set aside an afternoon (or two). If you rush, it can easily go wrong. Before you start joining fabric for curtains, you’ll need to assemble the necessary tools. A sewing machine (unless you want to go super-old-school). To do this, you’ll need to lay out a stretch of fabric that’s big enough for you to see the full repeat, plus a little bit extra. You’ll then want to establish the details included in the pattern. Pick out a sharply-defined landmark, and find the next one up. Measure the distance between the two. You should find that whichever part of the pattern you measure from, the distance remains the same. Take precise notes of the length, checking it against multiple landmarks. You need to match the length of the window, and a few inches extra. Decide where you’d like the pattern to start, and then measure down to the desired drop. Keep doing this until you have all of the drops you need. Lay the panel on your worktop, right-side up, and then lay the second panel upside-down. Double-check they’re the right length. If you’ve got the first bit right, they should align exactly. When the two patterns are exactly atop one another, you can start folding back from the side of the panel. Do this from the selvage edge, don’t attempt to join patterns from an arbitrary position in the middle of the fabric. You’ll quickly reach a point where the two patterns flow into one another seamlessly (almost literally so). Given that we don’t live in a perfect world, odds are your patterns won’t match up without a little extra help from yourself. Be prepared to move the top layer a few millimetres back and forth until the join is spot-on. If this is your first time doing this, it’s worth moving the fabric in and out of alignment so you can see what you’re aiming for. Here’s where precision is especially important. You want to match the seam exactly where the two features connect. Having done this, you’re going to need to thread a pin through the selvage and the layers beneath, at a point close to the centre of the fabric. Do this centrally, and you’ll prevent misalignment further up and down the sheet. You can then move along the curtain, smoothing out the crease and pressing it down to give it the required definition. Take your time when doing this, and move slowly along the crease. Don’t be tempted to use a ruler, as the resulting crease might not be 100% straight. Even a very small misalignment will probably be noticeable if you use a ruler across the width of the sheet. Go freehand instead. Thread each pin beneath the dotted line, through both sheets. That way, when you come to sew everything together, you’ll be able to minimise slippage. Do this along the entirety of the curtain, at crucial pattern points. Add a few extra pins a little deeper into the curtain for added stability. You can never really use too many pins, here – the more stable you can make the material, the better. Proceed with care – but bear in mind that you can always pick the two sheets apart and sew them up again if things don’t look quite right. So now you’ve successfully sewn together two sheets of fabric. Next, it’s time to check the results. If you’re happy, you can repeat the process on several more sheets until you have the desired width of curtain. What if there’s no pattern on the seam? If your pattern is more linear; for example, in the form of decorative lines that don’t join up horizontally, then the above approach won’t work. Instead you’ll need to use a long ruler to mark where the joins should be. This approach isn’t quite as precise as the one we’ve outlined above. Thankfully, however, patterns of this sort won’t show up unless there’s a severe misalignment. What you need is to measure the horizontal distance between the patterns. Do this in the same way we described above – by picking out a precise point and measuring the distance to the corresponding point on the adjacent pattern. You’re going to be cutting this measurement in half. This is the distance from the final pattern that you’ll cut at the edge of the fabric. Then, when two sheets are adjoined, the gaps will add up to the same distance and no-one will be able to tell, at a glance, where the join is.